Hi guys! 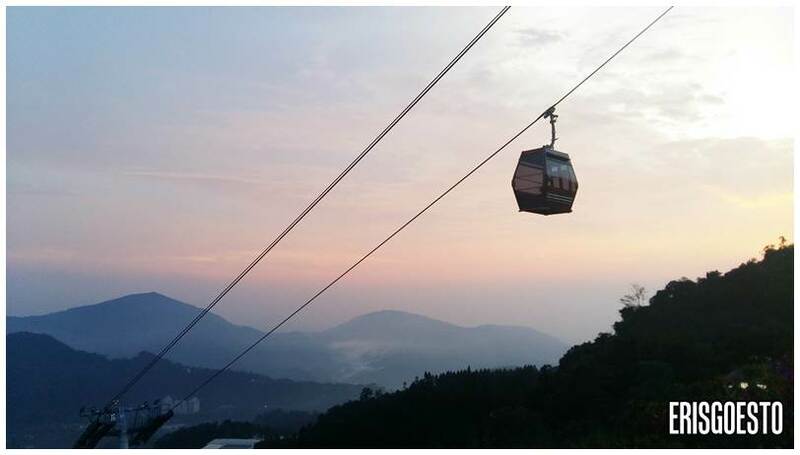 We’re at Genting Highlands, a mountain retreat that houses the only casino in Malaysia, at 6,000 ft above sea level. 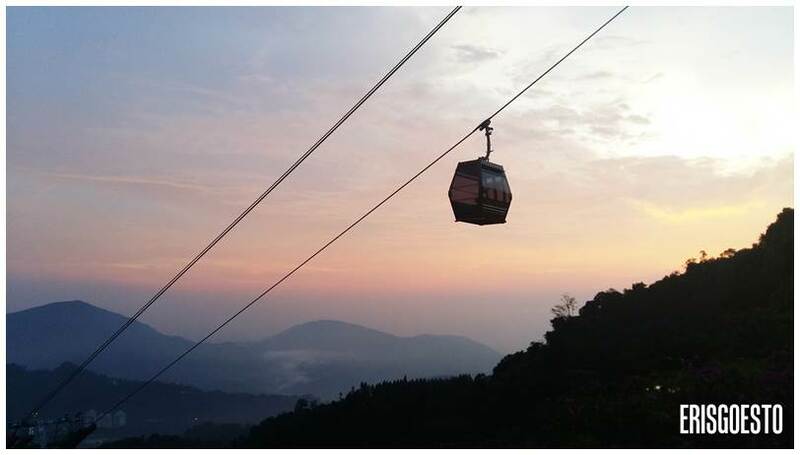 While most people would opt for resort hotels and apartments at the top of the hill, the fam and I went for a tranquil, less crowded option, away from all the entertainment. 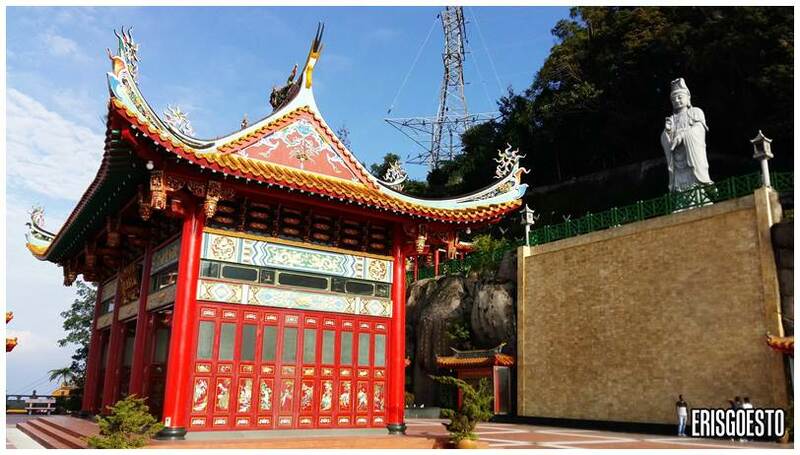 Just a 10min drive downhill, the Chin Swee Cave Temple is a Taoist temple that also doubles as a hotel, with very basic accommodation. When I say basic, I mean really basic – they don’t even have WiFi or TV! The beautiful views more than make up for that, however. 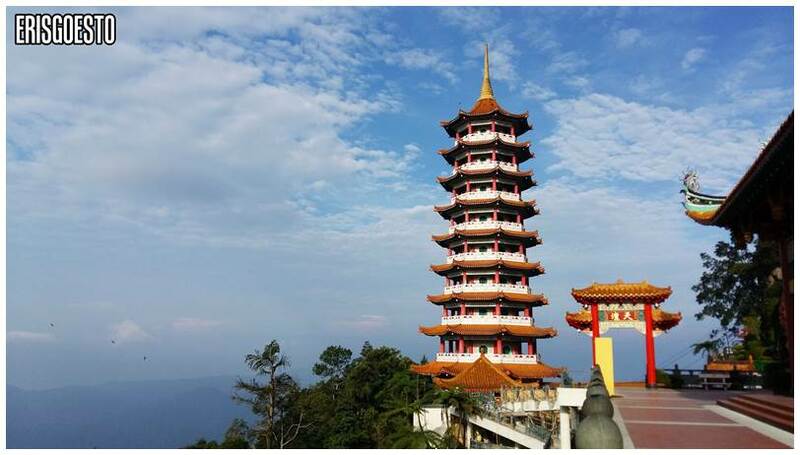 Perched on a slope, the temple commands a wide view of the valley below, and the high elevation often makes the buildings seem like they are floating on clouds. We got back from First World in the evening, and had to stop to admire the breathtaking sunset. The temple sits just next to the cable car line. In the distance, deep blue mountains stretch as far as the eye can see. 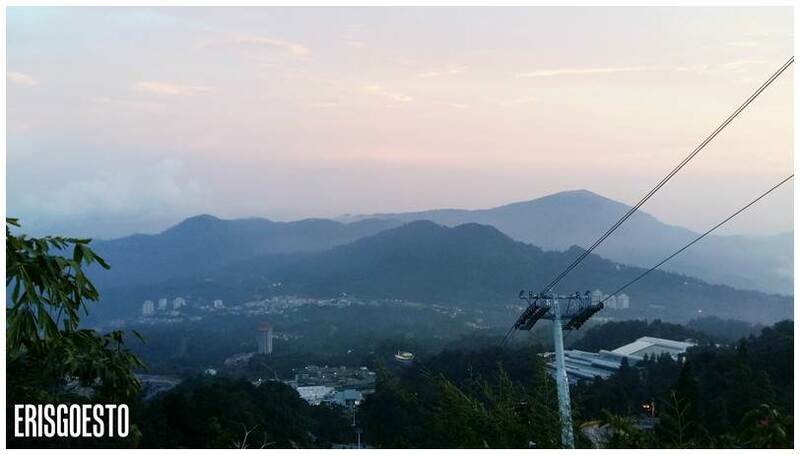 This is the Titiwangsa range, also known as the ‘backbone’ of West Malaysia which has mountains running all the way from the tip right down to the bottom of our sweet potato-shaped peninsula. 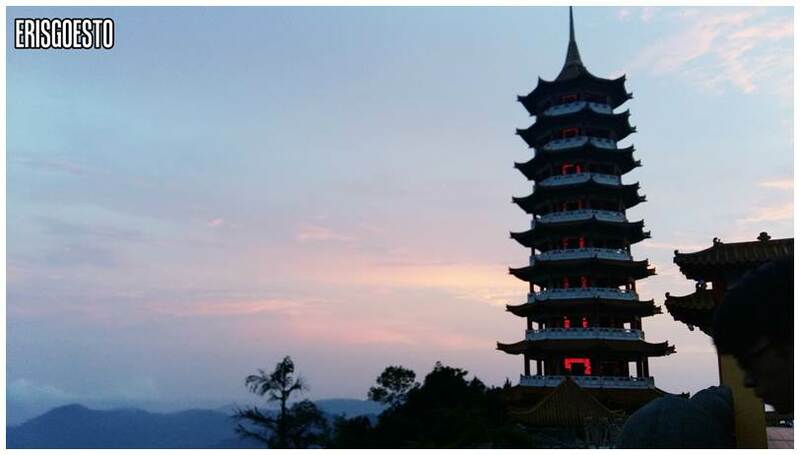 The pagoda structure glows with a fiery red light at night, like an ember. The temple grounds are pretty and peaceful in the daytime. 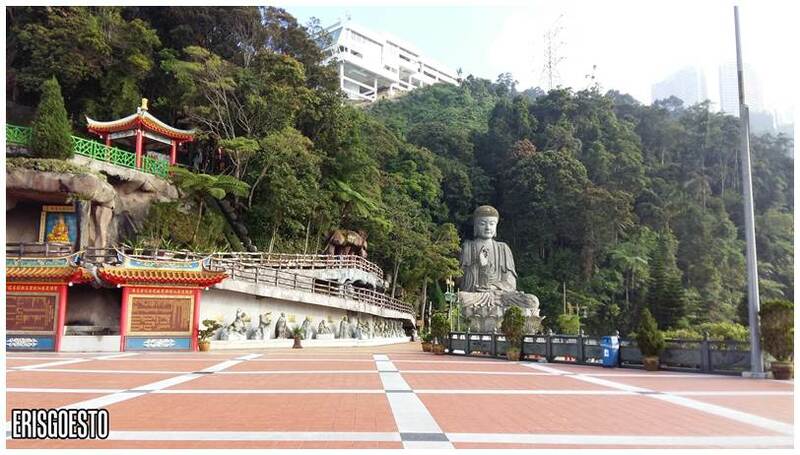 The place was built thanks to Tan Sri Lim Goh Tong, the same businessman who founded Resorts World Genting, who rallied friends and relatives from his native province in Fujian, China in order to establish the temple. The name, Chin Swee, actually refers to a Fujianese deity. 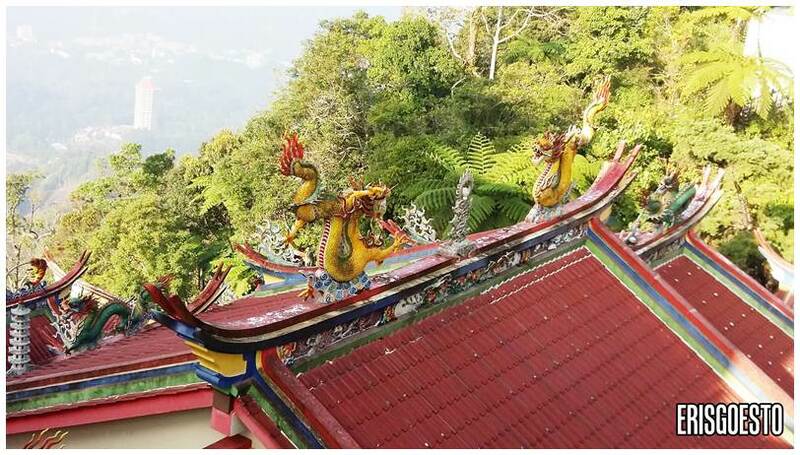 It was tricky to build on such a steep hillslope, but the spot had the best fengshui and Tan Sri Lim was determined to make it work. 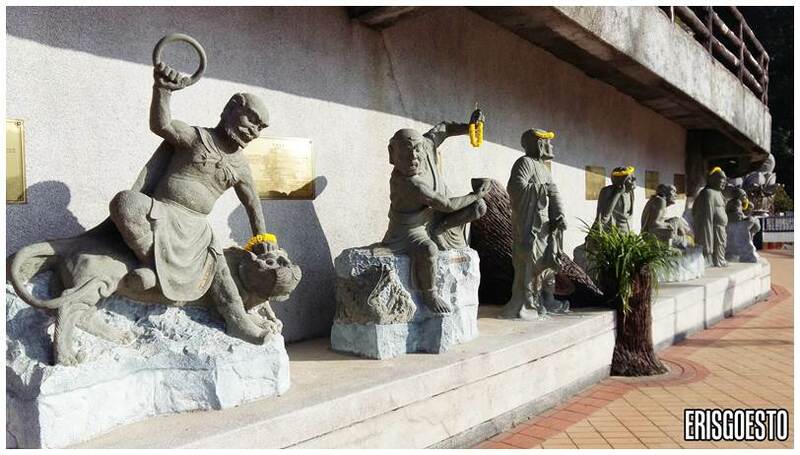 Being the project’s chief architect, planner, designer, contractor and supervisor, he employed workers who set to work using manual labour in order to dig the foundation for the temple, since modern machinery was useless in the rocky terrain. Construction took a long and arduous 18 years. It was finally opened to the public in 1994. The hard work has definitely paid off! The temples are a popular tourist attraction as well as a place of pilgrimage for many devotees, who come to marvel at the views and beautiful structures. There is a multi-tiered pagoda at the bottom, and a large open courtyard which houses several shrines. One of the shrines, featuring ornate decorations and detailing. Golden lotus flower carvings on a backdrop of blue seem to represent the blossoms floating on a lake. 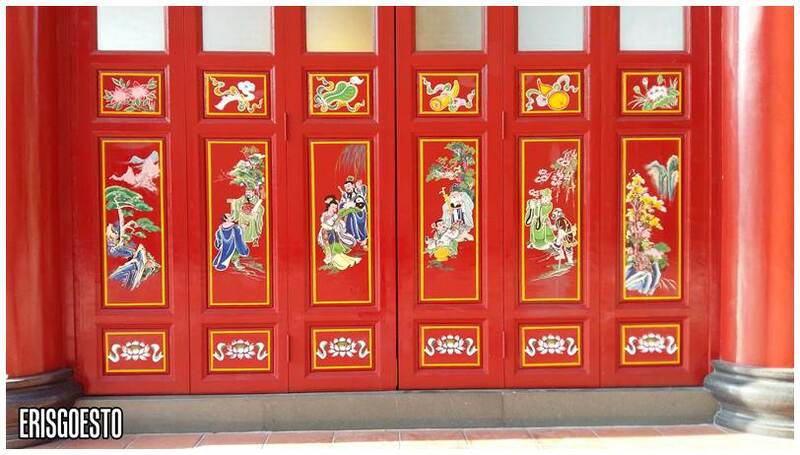 These are accompanied by dancing dragons, as well as paintings of deities, flowers and animals on the shrine’s wooden doors. 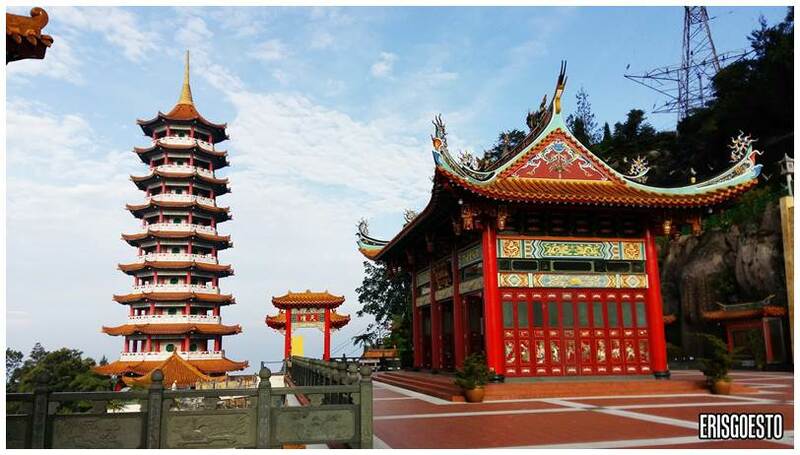 Buddhism/Taoism in Malaysia is an odd mix of culture, religion and philosophy. 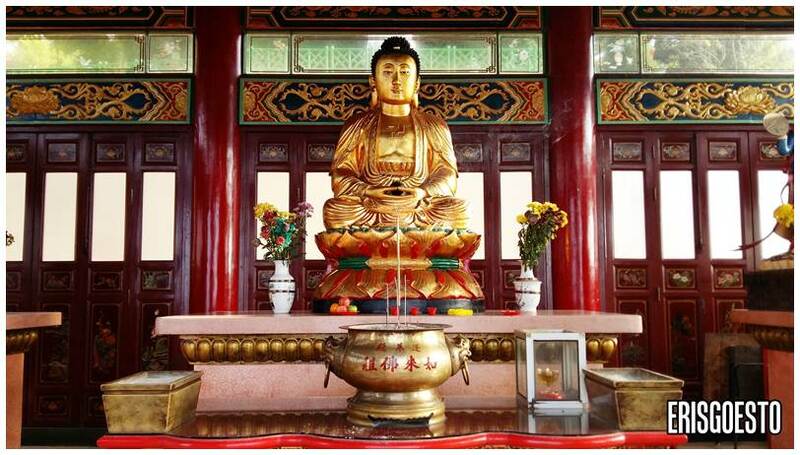 Many Chinese people,my relatives included, follow a blend of Buddhism/Taoism and Confucianism. The latter two has roots in China, and place strong emphasis on rituals. The Hungry Ghost Festival, for example, is a Chinese belief, but over time, these rituals have has blended into ‘Buddhist’ culture as well. Tibetan or Sri Lankan Buddhism is markedly different, and sometimes might even have different beliefs. I don’t really know how to explain it, but the best comparison I can give is probably how Christians have different sects, like Catholics and Protestants, etc.? Correct me if I’m wrong. We’re all here to learn. 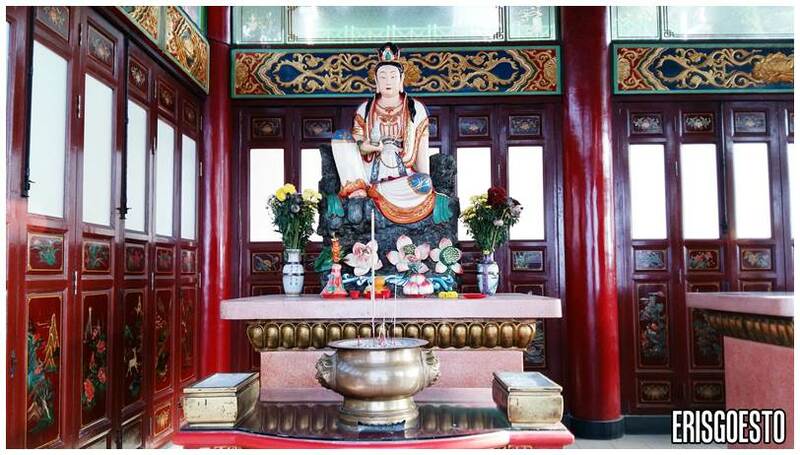 GuanYin, or the Goddess of Mercy, is often depicted seated on a lotus flower with a bottle of holy water in her hand that has magical healing powers. She is the embodiment of compassion and kindness, hence the name. Often referred to as an ‘East Asian Bodhisattva’ (Bodhisattva being one who has achieved Buddhahood), she is revered in East Asian Buddhist cultures, including Chinese, Japanese, Burmese, Thai, Vietnamese and Korean cultures. She also appears as a male deity in Tibetan Buddhism. When I was very young, my parents ‘baptized'(?) me to Guanyin for protection and blessings. I am supposed to be under this protection until a day comes when I choose to sever it, or if I don’t, for life. I use the word baptized in English, but in Chinese we call it ‘siong kai‘ or ‘to be adopted’ – so it’s like she becomes my godmother (literally). 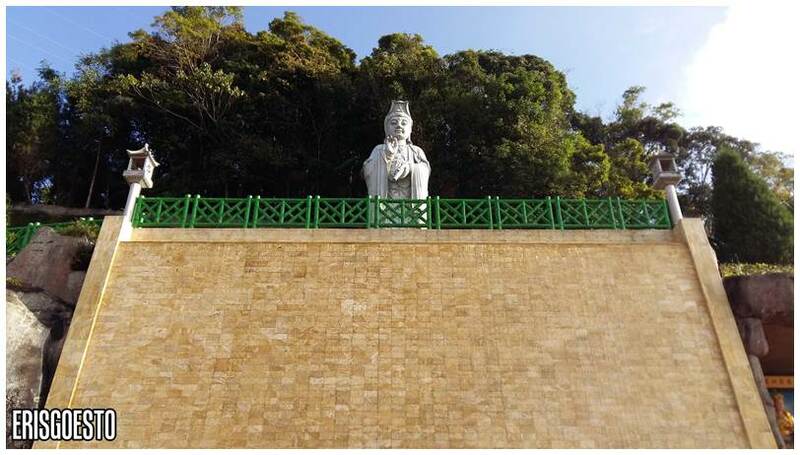 A large stone statue of Guan Yin looks down on the valley from above. Parents were tired, so bro and I continued exploring the temple grounds. 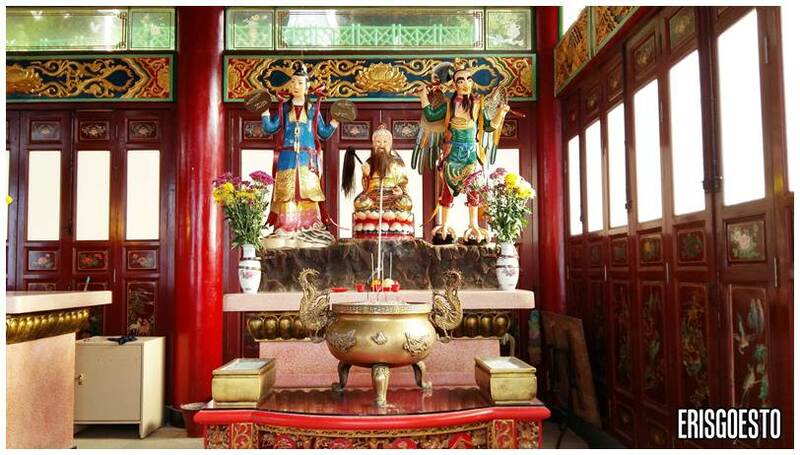 Here are some scenes from a popular Chinese legend, Journey to the West. Can you recognize the characters? 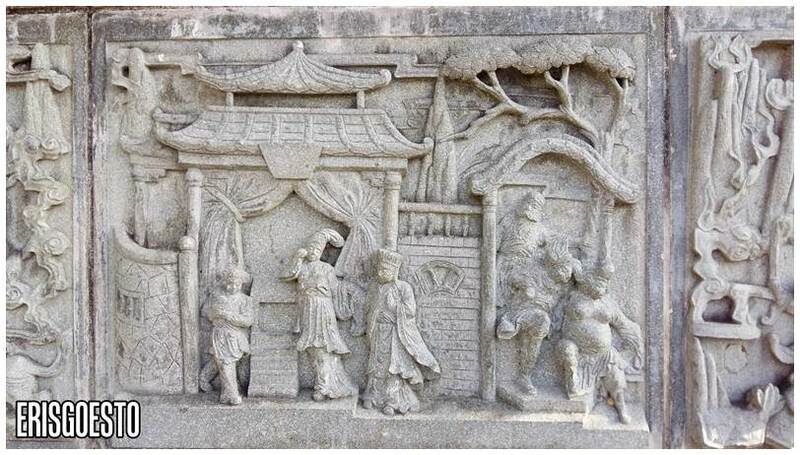 The story goes that the monk, XuanZuang, was decreed to travel to the West (hence Journey to the West) to collect sacred texts (sutras) on order of the Buddha. To aid him on his journey were three protectors: Sun Wukong the monkey, Zhu Bajie the pig and Sha Jing the sand demon, as well as a dragon prince who was to be the monk’s white steed. 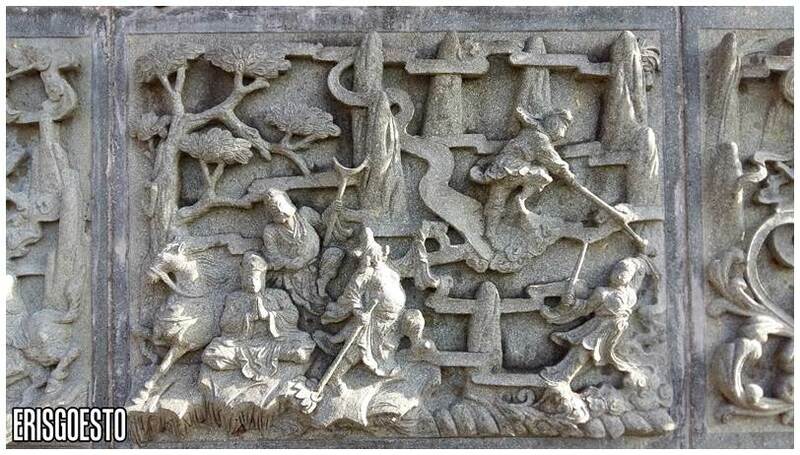 Journey to the West was published in the 16th century and is considered one of the 4 Great Classical Novels of Chinese literature. While the story is fictional, it’s actually based on a real person, Tong XuanZuang. 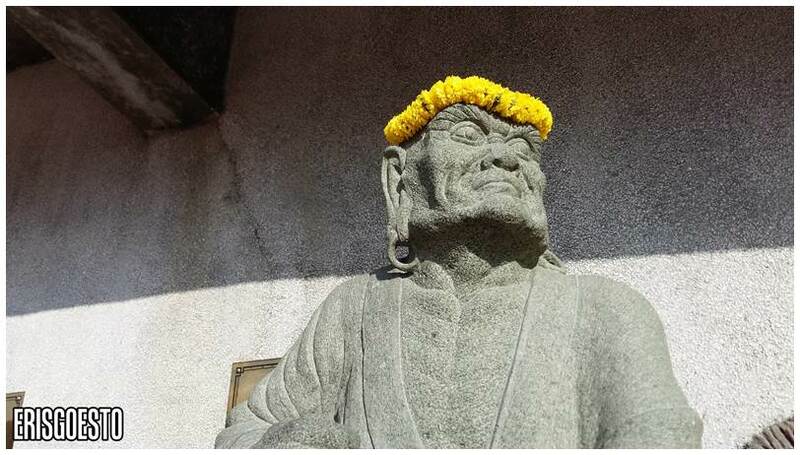 Born in China’s Tang Dynasty in the 600s, he was a monk and scholar who traveled all around China gathering sutras. He wanted to expand his knowledge to other places – and so began Xuan Zuang’s 17 year journey to Central Asia and India. Statues of deities line the courtyard. Each represents a different virtue. 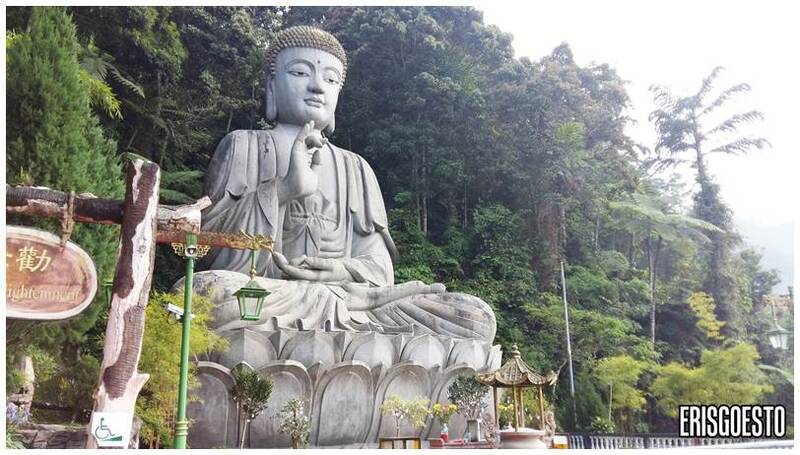 The centerpiece is a three-storey tall stone Buddha statue, which sits amidst a backdrop of forest and greenery. Behind the statue is a giant rock which holds it in place, and a natural stream that supposedly provides water with healing properties. Everything seems really beautiful in this part of the temple, but there is a less pleasant ‘Path of Enlightenment’ section, which chronicles one’s journey through Taoist hell. I’ll cover that in another post though. 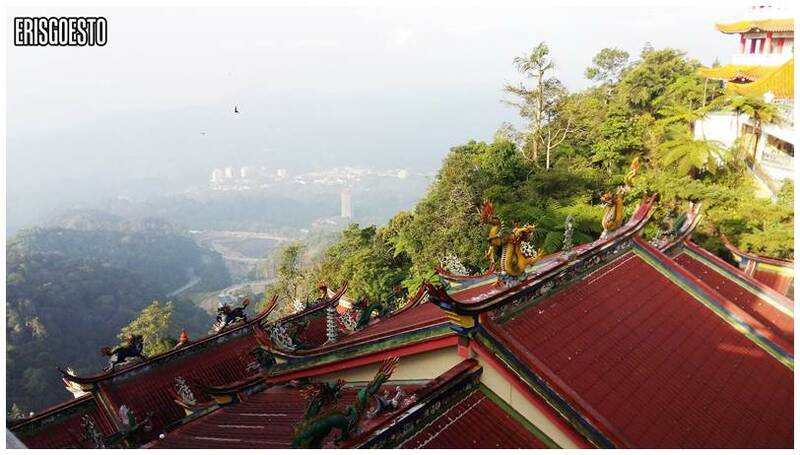 If you’re ever in Genting, pay a visit to these beautiful temple grounds and just soak in the fresh mountain air and peaceful environment. 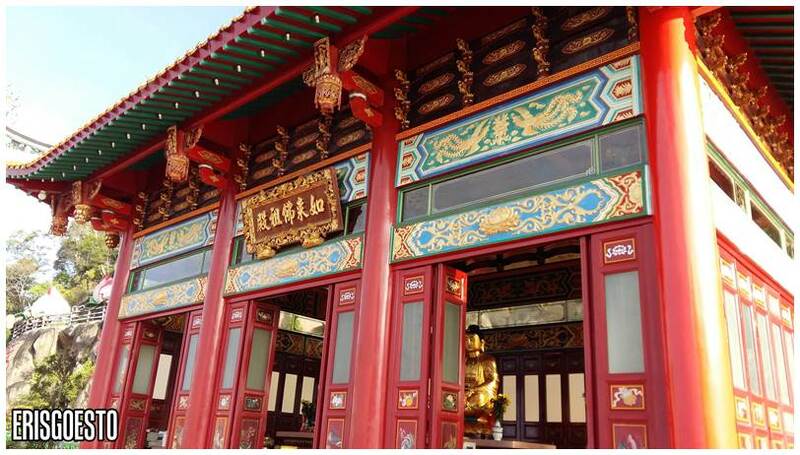 A word of warning though – Idk if this is pure superstitious belief, but this is what my mum told me – don’t go betting at the casino after visiting this temple. Apparently you’re bound to lose money lol.